My thesis here is that something was misunderstood. The question I'm left with is how did that happen? The first page of the caves proper contains the flavor text we discussed in the last post. It's lurid, and therefore interesting. If you're going to ask someone to listen to something, it better get a reaction. Immediately Gygax takes one column line to outline all his overview notes for the adventure: 600 words. He describes how to read the cave contour map on the outside, describes the woods, underground, and interiors. He then covers prisoner ransom ("Set the sums low — 10 to 100 gold pieces or a magic item. . . "), the specifics of the tribal relationships, how monsters should react and handle player actions, and what happens in empty areas. 1. Guard Room: 6 kobold guards (AC 7, HD 1/2, hp 3 each, #AT 1, D 1-4, Save NM, ML 6). They will throw their spears the first round if they have initiative. Each carries d6 silver pieces. One will run to warn areas 4. and 6.. The guards will be altered by loud noises or lights. Is there a single unnecessary word in that description to craft an emergent encounter for the players? All the rooms are like this. "Number. Description: # creatures (one line stat block), Rules and tactical information, treasure." Is there any boxed text? No. Each room only tells you what you need to know what's in it, and more importantly how they act. The text is there to create emergent play. Here are quotes. "This huge kobold is so powerful that he fights with a battle axe. . . and a large gem on a great golden chain around his neck." "Six goblin guards are alterly watching both passages for intruders of any sort"
"If there is a cry of "BREE-YARK" similar to "hey rube!" (ed: noted in the rumor section as goblin for "We Surrender"), 2 of these guards will rush to the secret door, toss a sack with 250 gold coins to the ogre and ask him to help him"
This is over and over again in the room encounters. Set-ups from earlier pay off. Encounters are dramatic scenes. We know from his own play descriptions that he used random encounters and avoiding keying many areas in Greyhawk for these reasons. Each one uses as few descriptive words as possible to give the Dungeon Master a hook to hang his hat (the encounter) on. There's no ancient history text, no unknowable background information. Mostly. I lied a little bit. Everyone had to get the wrong idea from somewhere, right? Even when there is some unknown history, it is referenced and due to non-player character actions is discoverable by players. e.g. 13. Forgotten Room. Only the two orc leaders (from this area and from B.) Know of this place. They secretly meet here on occasion to plan co-operative ventures or discuss tribal problems, for although separate tribes are not exactly friendly, both leaders are aware of the fact that there is strength in numbers. . . .
From 12. 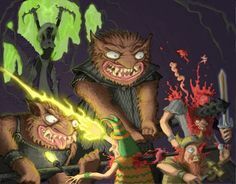 Orc Leader's Room: . . . If hard pressed, the leader will wiggle behind the tapestries on the south wall and attempt to work the catch on the secret door to the south and go to the rival tribe for help. . . So you know, it's part of a dynamic encounter. I've talked before about how room environments should consist of clearly interactable objects in Red Herring Agency. That article uses the example of play from the Dungeon Master's Guide, and it's pretty clear the same design aesthetic is in use here. In the forgotten room, it describes "A small table and two chairs", "a wooden chest", "Two shields hanging on the wall", and "Two pouches behind an old bucket." The chairs are normal, as are the shields. The chest is unlocked and contains some weapons. The pouches have treasure, but cover 2 centipedes. It's explicit, direct. Here are the interactable objects. Each one has a different effect and clues are available in the environment. There is a specific structure to the different pillars of play. This is what the exploration pillar means. It means there are specific presentable things—clickable objects— within play. It's these objects, their integration into the environment, their creativity, and the tactical infinity options they offer that is the gameplay of exploration. Walls the players can knock over, doors that open into space, a ring that shrinks objects, a chained megatherium. Give the players simple things that allow interaction. Create a world where non-player characters take action in response to the players. The complexity and gameplay is emergent. Every single piece of information is either immediately accessible to the players, or is necessary for the Dungeon Master to run the encounter. I'm not saying it's perfect. It's certainly raw—for example many rooms have information on how people act if they hear someone nearby. This could be on the map, along with other modern improvements due to better tools. Which way the doors open, what the light levels are. . . When the goblins rush the players and yell BREE-YARK, if the players got the rumor that it means "We surrender", shenanigans ensue. This isn't the only setup. More than one character is lost when the chaotic evil priest that offers to come with them from the keep casts 'inflict wounds' on characters instead of cure wounds. The prisoners have a variety of races and genders, as well as each providing some non-standard reward, trick, or trap. You may notice a theme. There are also slaves that can be freed and armed. Each of these things creates a specific experience for the players. He isn't just writing descriptions of rooms! He's creating a scene flowchart just like the one in the start of Deep Carbon Observatory, but using the dungeon as his flowchart paths. I did find a sentence of flavor text, "The owl bear. . . sleeps in the most southerly part of its den, digesting a meal of gnoll it just caught at dawn." That's some information that's not accessible to the players. It's on page 19.
invited for dinner!" and "Safety, security and repose for all humanoids that enter — WELCOME! (Come in and report to the first guard on the left for a hot meal and bed assignment.)" The thing is, it's not just a joke for the reader. The players will also find this joke amusing, and although it's funny, like all Dungeons & Dragons, it's deadly serious. I ran Hackmaster for years, and a gummi bear golem seems really funny, until it crits your fighter in the head for 38 points and kills him in a shower of sticky blood. All of the rooms contain setpieces—interesting reactions and organic events, but this is one of the best. "[Bugbears] lounge on stools near a smoking brazier which has skewers of meat toasting over the coals. Each will ignore his great mace when intruders enter, reaching instead for the food. Through they do not speak common, they will grab and eat a chunk, then offer the skewers to the adventurers — and suddenly use them as swords to strike first blow (at +2 bonus to hit due to surprise!) unless the victims are very alert. . . I mean, that exclamation point though. If you aren't creating scenes and experiences through activities for players (and not excess verbiage) please start, and point people to this series to get them to change. You don't have to write a bunch of words about how encounters react to every last thing, you just have to write something interesting well, and from that the Dungeon Master will be able to know how it reacts. Why? 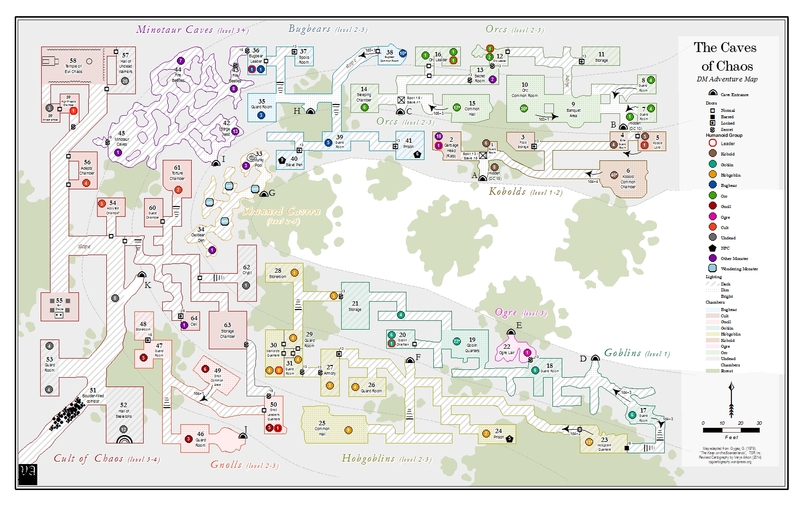 I just downloaded the most recent Dungeons & Dragons pay what you want adventure to find a room description to compare. Each room description is literally a full page. In lieu of typing the whole page, I'm just going to quote some random sentences from this full page of text for a single room. A whole page. It's not even an A5 page! It's a full letter page. "The bed is perfectly normal and has a warm, soft blanket stretched over it." "The party is in the right place, but this isn't the chamber in which the wardrobe is kept." "Unbeknownst to the players, a hidden passage lies beyond the bookcase"
The box text says "the chamber. . . is not quite what you imagined"
I will summarize the entire room description, as I think Gygax would have laid it out. 3. Wizard Bedroom. Locked Chest (Disable Device DC 15, Strength DC 20) contains pouch 32 gold, 13 silver pieces, 21 copper. Secret door behind bookcase filled with bird books. Note in book about secret door. Corridor beyond trapped, must flap like bird or say "[REDACTED]" 50 XP for door, 50 XP for ladder. You do not need 1,200 words! I am a Dungeon Master looking for useful tools! The early examples were great and maintain their popularity and utility decades later, look at the sales of the poorly-reviewed Keep on the Borderlands 5e reprint. They had to hold a second pre-order since pre-orders exceeded their first print run. This endless glut of poor adventure writing is someone emptying their uninteresting brain noise right in the middle of what I need as a person that runs a lot of Dungeons & Dragons. Is there a market for people who want to read an adventure and have no use for it during play? Yeah. there is, and it's pretty big. That's the problem. People keep trying to characterize "What the old school renaissance" is. This has never been a mystery. It's just people trying to find something they can use in play! People were playing Dungeons and Dragons until people who did not play, and instead just read and admired ran it into the ground and nearly caused it to cease to exist. You can clearly publish a game with no firm rules and just allow everyone to do what they want, but they aren't very successful are they? I would think everything in this post is obvious, but due to my inability to use 90% of everything ever published it apparently is not. If you feel the same way, link it the next time someone doesn't know how to write a module. Or, if you're feeling generous, you can join our hierarchy over here, and support more posts like this on Patreon, where you can get special access to my discord. Obvious but elusive. It’s obvious what makes a good pop song but 95% of them are bad. Additionally, writers get paid by the word/page count. No one will spend $8 for a four-page dungeon, but he might pay $8 for the same dungeon stretched out to 32 pages. That's a great point, Scott. I've done some work as an editor on RPG books, and when you take time playtesting and revising, a book often gets shorter, not longer. Yet, you always find people on forums complaining about how a book doesn't have enough pages to justify a price, as if good game design was simply a matter of quantity. Game books aren't potatoes, and it doesn't make sense to price them by the pound. As an editor, I charge based on the initial word count of the document, so I can prune away without hurting my bottom line, but I feel bad for the writers that get paid less for the virtue of brevity.